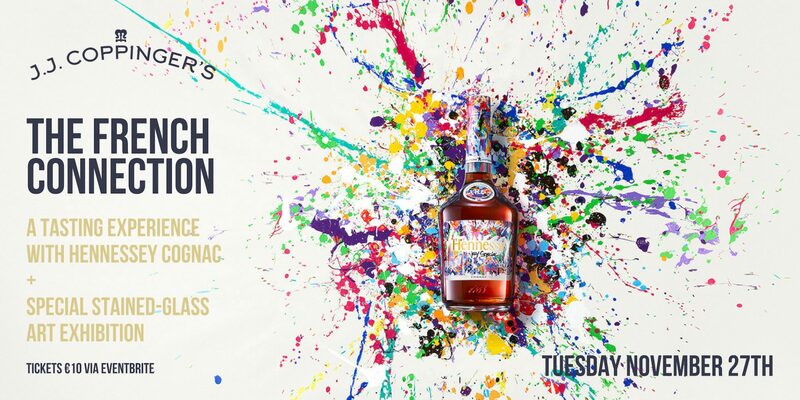 J.J. Coppinger’s is proud to announce its collaboration with Hennessy and Cork-based stained glass artist, Peter Martin, for a special cognac tasting & an immersive art experience on Tuesday, 27th of November. Guests will be treated to a Hennessy masterclass sampling the full Hennessy range from VS “Very Special” to XO “Extra Old”. A custom-designed stained glass piece reflecting the architectural glory of J.J.Coppinger’s building will be exhibited on the night as the artist discusses the process of making the piece and how it depicts the building’s design. The event is inspired by Hennessy’s longstanding tradition of artistic partnerships. The building at 55 Main Street, Midleton was designed by architect Augustus Pugin, who was famous for being a strong champion of the gothic revival style of architecture, setting new standards in design. He is known by many as the man that changed the face and the mind of British architecture in works as revered as the House of Lords and the clock tower at Westminster, known as Big Ben. St Mary’s Cathedral in Killarney, Adare Manor and St Colman’s Cathedral in Cobh are arguably his most well-known works in Ireland. Guests will receive Hennessy & Ginger on arrival, a cocktail made with Cognac, dry apricots, ginger, lemon, and brown sugar and can kick back and relax to some hip-hop beats as the event comes to a close. Tickets are €10. The event is limited to an audience of 30 people. 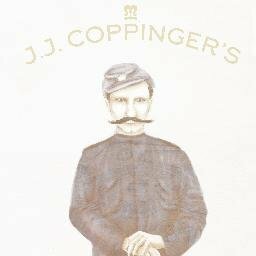 J.J.Coppinger’s building was designed by Gothic Revival architect AWN Pugin for Lord Midleton. Pugin is celebrated by a portrait and several copies of his architectural drawings in the J.J.Coppinger’s smoking room. * Originally built as two houses, it was used as an inn in the latter part of the nineteenth century. Constructed with fine quality materials, the building demonstrates both high-quality design and craftsmanship. It forms a local landmark in the area. About €750,000 has been invested in the AWN Pugin designed building to bring it back to its former glory. Hennessy has been supplying quality, creativity, & fine cognac since 1765 and it produces more than half of the world’s brandy. Although produced in France, the brand was created by an Irishman. Richard Hennessy was born to an aristocratic family in County Cork in 1724. As was fairly common for a man of his stature, Hennessy left Ireland for continental Europe, where he fought for Louis XV’s army. Hennessy has always cultivated ties with the artistic world. Whether novelists or artists, classical or hip-hop musicians, Hennessy is a name that inspires and, often, supports them. Hennessy is an ambassador for French ‘art de vivre’ the world over. Peter Martin is a recent graduate of the Crawford College of Art and Design where he specialised in stained glass and glass casting. He had the opportunity to study the processes of kiln-fired glass casting as part of an exchange programme with the Glass Department in the Fine Art College of Shanghai University in 2013. Martin is using traditional stained glass techniques to depict the historical building’s architecture. His work has formed part of various collections in Cork such as that of St. Finbarr’s Cathedral (UCC) & Cork City Council. Born in 1812, the son of a French draftsman, at 15 Pugin was working for King George IV at Windsor Castle. He was one of Britain’s greatest architects, and his short career one of the most dramatic in architectural history. By the time he was 21 he had been shipwrecked, bankrupted, and widowed. Nineteen years later he died, insane and disillusioned.